These have been a favorite cookie recipe while transitioning off of white flour and sugar. 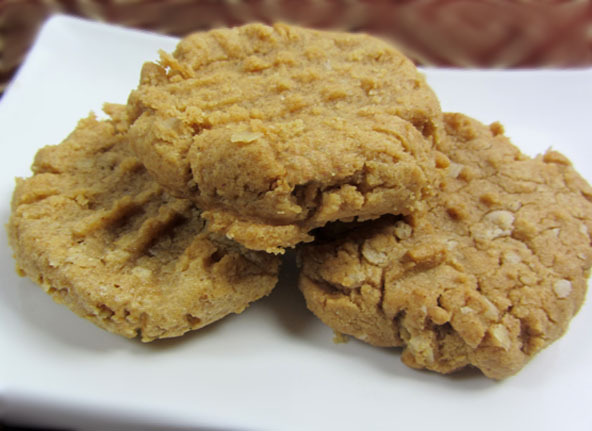 Luckily they are easy and quick to make and gluten free if you use gluten-free oats. Well, technically there is no such thing as gluten-free oats. They just don’t have the same gluten as found in wheat, barley and rye but they do have another form of gluten that can be a problem for some. See this article from the Gluten-Free Society here. If it is not a problem for you, you may enjoy this recipe. While I love gluten-free cookies made with almond flour, whole grain oat flour is much cheaper. These cookies are really good. If you are wondering what to take to a gathering or to a friend, this could be the perfect recipe. In a medium mixing bowl, beat the eggs, granulated choice of wSugar, salt and vanilla until well blended with electric beaters. Add the peanut butter and rolled oats and stir together with a spoon until its the right consistency. Use a 1 or 1½" ice cream scooper or Roll cookie batter into 1 or 1½" balls and place on a cookie sheet. Flatten with a fork, creating a criss-cross design. Its better to under bake these than to over bake them. They should be soft and chewy for the best flavor. Omit the oats and add in ⅓ cup chopped, roasted peanuts.